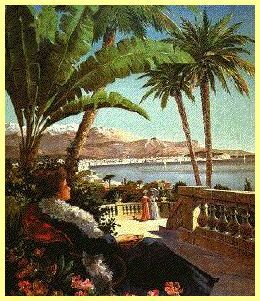 T hough the English aristocracy of the mid-19th century somewhat arrogantly like to claim the RIviera for themselves, the majority of the towns along the coast of the Mediterranean have a truly ancient history - and Nice is no exception. The citizens of Nice trace their city's name back to the Greek Nikaia- City of Victory. Though other accounts say that it was founded by the Marseillais in 350 BC. Whichever is the closer to truth matters not. Nice has been created and shaped by successive waves of foreigners who occupied the eastern end of the Bay of Angels facing Antibes . Of course, the Romans had their time in Nice (as they did in most of Europe). After their decline and fall, the city became part of Provence until 1388. Then the Savoies of Switzerland and Northern Italy took over. In 1543, the Niçois had an opportunity to demonstrate their sense of humour. In order to frighten off advance guards of an invading Turkish army, a common laundress of ample proportions who was also exceedingly ugly, climbed a ladder and showed them her vast and bare derriere. With surprising good sense, the Turks retreated and the new heroine of Nice was adopted as the patron saint of the city. No simple virgins for the Niçois. In mid-19th century while Nice still belonged to Italy, King Immanuel III hit on a plan to enrich his country the easy way. He sold Nice to Napoleon III in exchange for French financial and military help. Although the deal was done secretly the Niçois were allowed to vote so they could not say that they were being sold down the river. Although that famous statesman Garibaldi - who was born in Nice - urged them to vote against the deal, there was an overwhelming majority in favour. The voting booths were manned by units of the French army and this may well have affected the outcome. So the English were by no means the first settlers here. But, when they did arrive, they brought a prosperity to the Niçois never before known. Even before the end of the 18th century there was no shortage of English food and drink. The English built houses, and because they were religious they built churches. Soon they would need a cemetery - and so the place expanded. But during the winter of 1821-22 an unusually sharp frost prohibited more building and there was much unemployment. The English church demonstrated its practicality by raising funds and putting many of the unemployed to work to build a walkway by the sea. This is how the Promenade des Anglais came to be built - and named. After the incorporation of Nice into France, the railway from Marseilles was extended. That of course really put Nice on the map, and as a result, Nice became the first city to have a tourist-based economy. Until then, people travelled for economic, religous, or cultural reasons. Now, for the first time people travelled for pleasure. They came south to "get away from it all" and "to get away with everything". The modern tourist industry was born. Pretty impressive, as the word tourist did not even exist in the French language at that time.It does now - Le Tourism . One final point is worthy of mention. The eagle's head on the coat of arms, which had swivelled from left to right depending on whether Nice was owned by France or Italy, now became permanently facing to the right, and so it remains to this day - to the relief of the Niçois. In heraldic conventions, a left-facing eagle denotes an illegitimate branch of the family.